Sandy Candy: We Bring Candy, You Add The FUN! Are you looking for a way to raise money for a cause while keeping the atmosphere fun and light? It's safe to say: you've found your solution. What if we told you that you can now organize an unforgettable party armed with one, simple kit? Sandy Candy was invented by Roxy Klein, who drew inspiration from her father, David Klein, the inventor of the Jelly Belly. Quickly gaining fame via word of mouth, Sandy Candy is a candy version of sand art. Go Far With Sandy Candy! You can use our kit to create custom candy creations, following the color scheme of your teen's high school colors or your young adult's college colors. You can use the tubes to fundraise for the charity of your choice, raise money for a good cause at the office, or get a little boost from the congregation. Each kit contains 10 of the following flavors: Sour Lemon, Sour Bubble Gum, Sour Blue Raspberry, Sour Cherry, Sour Apple, Sweet Banana, Sweet Orange, Sweet Watermelon, + 2 mouth watering surprise flavors! And of course, 250 5" tubes so everyone can join in on the fantastic DIY candy making experience! Get Your Own Sandy Candy Fundraiser Kit & Raise Money the Fun Way! ● DIY CANDY! : Simply the best, most fun activity to turn ANY fundraiser into a memorable hit! The Sandy Candy Fundraiser kit contains everything you need to set up your very own candy making station and raise money for school, church, or the office. All while keeping kids endlessly entertained in the most fun, educational - and TASTY! - way. ● EDIBLE SAND ART: What's better than making art? Perhaps only the ability to taste it once your masterpiece is done! Inspired by this childhood dream, we have come up with a complete, affordable sand candy making kit, which will enthuse little ones and grownups alike. ● FILL, CAP, TASTE! : Provide a fun test tube to all your little guests and unveil their beautiful, multicolored art supplies - our sand-candy filled bottles! Then, let them fill out their tubes with layers upon layers of delicious sand candy, give a helping hand in fitting the caps over the tubes and watch as their faces light up as they taste their bespoke candy creations! ● RAISE MONEY THE FUN WAY: Planning a fundraising event at school, church, or the office? Raise money like a pro by purchasing this interactive pack of Sandy Candy in bulk. Plus, your attendees can take the fruits of their labor at home. Our Sand Candy making kit makes for a smashing DIY favor which will have your guests talking for AGES! 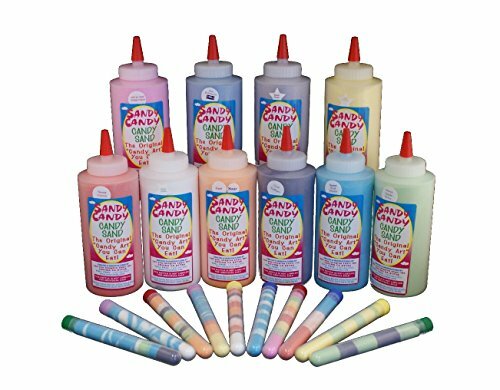 ● VALUE FOR MONEY KIT: We are offering you 10 BOTTLES of sandy candy, as well as 250, 5" TUBES, at an unbeatable price point! Get Your Own Sand Candy Making Kit - And Stock Up For All Your Upcoming Special Events & Parties, NOW! If you have any questions about this product by Sandy Candy, contact us by completing and submitting the form below. If you are looking for a specif part number, please include it with your message.